Home › Common Windows Errors › Help! Why Do I Get A Blue Screen Of Death? Help! Why Do I Get A Blue Screen Of Death? New Installed Software – Some programs do not work well together when installed on the same computer. An example of this is Norton AntiVirus and McAfee Virus Scan. The two programs conflict with one another and can cause a blue screen of death. Often times the blue screen will appear after installing software and running it. Remove the most recently installed software if this is the case. Software Errors – Nothing is perfect and software is far from it. Errors will sometimes occur that cause random blue screen of death that never happen again. However, if the problem persists look for the error code and determine the software causing the problem. Hardware Errors – New hardware can sometimes cause a blue screen of death. Check and make sure the version of Windows supports all hardware connected to the system. Also, make sure no existing hardware is melted or damaged. Defective/Malfunctioning RAM – Ensure all memory sticks are in place and firmly locked into their respective sockets. Replace the memory to check for possible memory errors. Startup Errors – System files are subject to corruption just like any other file. Use the Recovery Console in Windows to fix this. Regular computer maintenance is recommended to lower the chance of a blue screen. USB Drives – USB devices can sometimes be the cause of a blue screen of death. Check all USB devices have the latest drivers and updates. Overheating – overheating can occur in various areas of a computer. Make sure the computer has sufficient air ventilation as well as a decent heat sink. Clean out dust regularly to ensure airflow is not blocked. To determine if overheating is causing a blue screen restart the computer with the case open. Record the amount of time it takes to blue screen again. Compare that time with how long it took to blue screen with the case closed. Defective Hard Disk – Sometimes a hard disk is corrupted and there is nothing the user can do to fix it. Buy a new hard disk and install Windows on it. Backing up hard disks is recommended to avoid any possible data loss. 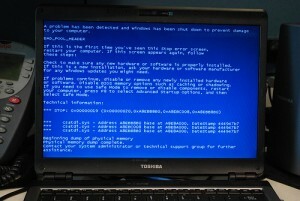 Windows blue screen of death can be caused by a number of problems. Slow computers that have regular blue screens should be scanned for viruses, spyware and other malware. Regular computer maintenance lowers the chance for getting a blue screen of death.